Pastor Susan is currently away on sabbatical leave. If you have a pastoral need, please contact our Supply Pastor Kathy Reid. Her information is below. Rev. Kathy Reid will be our new supply pastor beginning November 12th. Kathy grew up in Stone Mountain, Georgia, a suburb of Atlanta. She graduated from Furman University in Greenville, SC with a degree in education in 1980. After getting her Master of Divinity degree in 1987 from Southeastern Baptist Theological Seminary in Wake Forest, NC, Kathy was ordained to pastoral ministry in 1988. She did further graduate work in pastoral counseling in Des Moines, Iowa, where she met her husband of 16 years, Ric Olson, a United Methodist pastor. In Iowa Kathy's ministry included being an interim pastor, teaching, and pastoral counseling. Kathy and Ric moved from Iowa to Wisconsin in 2008. 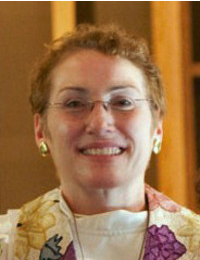 She pastored two United Methodist churches near Madison, Wisconsin until 2012, when Ric was appointed to St. Luke United Methodist Church in Sheboygan. Kathy was the co-pastor at St. Luke United Methodist Church, as well as a chaplain at St. Nicholas hospital from 2012 until 2016. In 2016 Kathy and Ric began serving at Wesley United Methodist Church in Sheboygan. Kathy and Ric have 2 tabby cats, Buddy and Tom. In her spare time, Kathy likes to quilt, read, garden, look for shells at Sanibel Island, and take walks along Lake Michigan at Hika Bay in Cleveland, Wisconsin, where she and Ric currently live. She is looking forward to serving as supply pastor at Faith and Bethel United Methodist churches while Pastor Susan is on sabbatical.